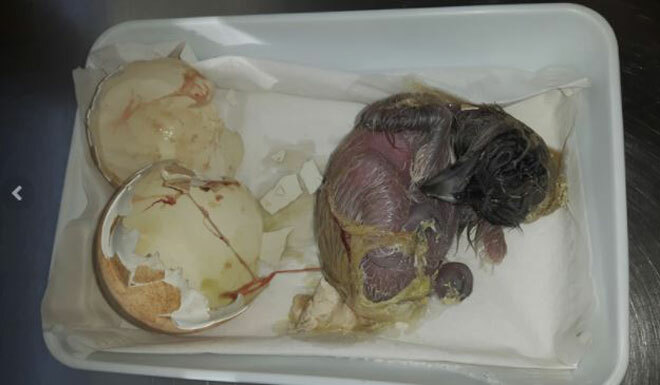 Two days ago the first baby bearded vulture of the year hatched in Austria. As it often happens, it came in the middle of the night – at 4:00 a.m. on the 25th of January the first chick started to peck the egg at the Richard Faust bearded vulture captive breeding center, and it took around one and half hour before the chick hatched by itself. This chick is a descendent from a very successful breeding pair. The parents are a 26 years old male, descendant from the second oldest founder pair from Tierpark Friedrichsfelde (Berlin), and a 29 years old female, one of the descendants from the only bird coming from Crete. They have produced 30 eggs between 2002-2017, from which 22 chicks hatched and 20 fledged. Eleven of these have been released in the different on-going reintroduction projects, while nine were included in the captive breeding network. This female is one of the most successful breeding birds in the bearded vulture captive-breeding network – only two other females have produced a higher number of descendants (24 and 35 chicks). The Richard Faust Center is one of the three large specialized bearded vulture captive breeding centers. It was created in 1978, and together with the center from Vallcalent (Catalonia, Spain), it is specialized in breeding founder birds and/or birds with behavioural anomalies or physical disabilities. The third center, Guadalentín (Andalusia, Spain) aims to produce as many chicks as possible and adopt chicks coming from other institutions. All three centers are part of the bearded vulture captive network where 40+ zoos, animal parks, private institutions and wildlife rehabilitation centers are working for the conservation of this endangered species. This network, organized in a European Endangered Species Programme (EEP) under the European Association of Zoos and Aquaria (EAZA), is coordinated by the VCF. Most of the chicks bred in captivity are released in one of the on-going projects: Alps, Andalusia, Grands Causses –included in the framework LIFE GypConnect project, Corsica, and from this year also the Maestrazgo-Els Ports project in Spain. The VCF would like to thank all of these zoos, and their staff and volunteers, for this great collaborative work. Without them, the bearded vulture would not be flying high above the alpine peaks, the craggy peaks of Cazorla, the gorges of the Grands Causses and the mountainous island of Corsica. Thank you very much!